The configuration of the city is a result of the activities which inhabit it. These activities can create and contain space or just be the surface upon which events are played out. The Pot Cove Development has been designed with this concept of urban form in mind. 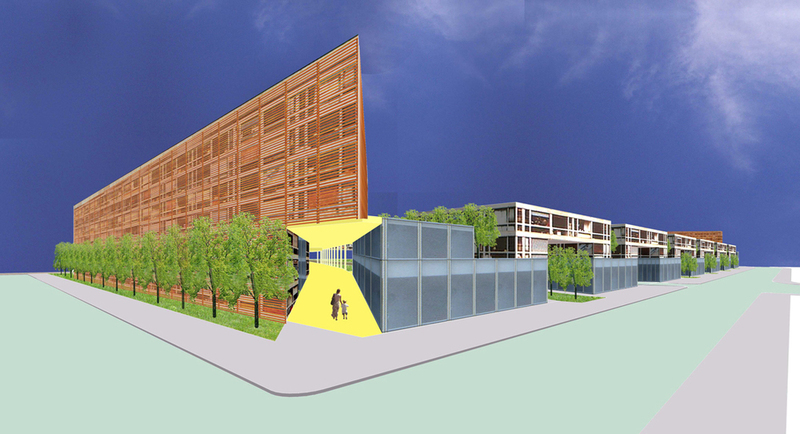 To aid in defining this urban form and activate the site through the program, four land/building scapes were created. These are the LIVING, SOCIALIZING, RECREATION and MOVEMENT scapes. First, the LIVING scape was made from an overlay of a section of Central Park upon the site. The paths from that section became the boundaries from which the housing was extruded. Attention was paid to the building orientation so that along three edges of the site the structure was taken to its maximum allowable height of seventy feet. Only along the southern edge of 26th Street does the perimeter building lower to provide sun exposure to the interior of the property. Second, the SOCIALIZING scape was thought of in terms of a continuous inclined movement through the site. To achieve this a circulation diagram was made from studying the irregular buildings and pathways of the ancient Casbah. The Casbah was used not only for its strong spatiality but also for the idea of the public space as gathering space and marketplace. This Pot Cove community has the opportunity to engage a microcosm of the city itself. A new place where the LIVING and SOCIALIZING scapes flow into and out of one another. 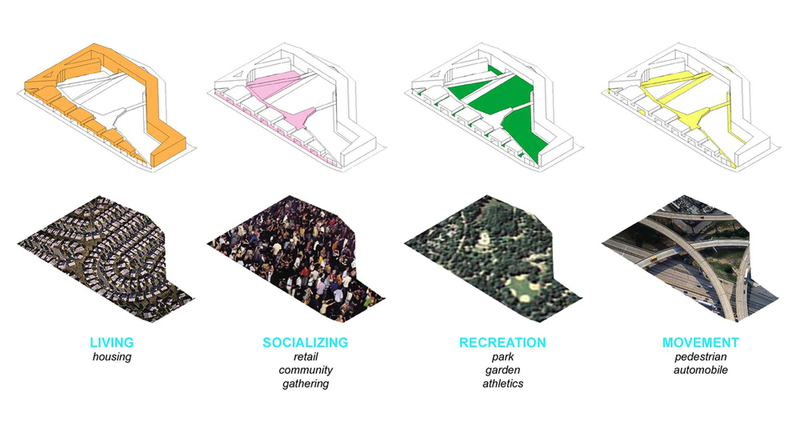 Third, the RECREATION scape resulted from the desire to maintain a nucleus of open space that served the needs of the inhabitants but would also become a room open to the pubic activated by gardens, playgrounds, paths and picnic areas. In all, seventy percent of the site has been left as open area. In form this scape became a plinth that rises gently from 26th Street towards the river culminating in a terrace overlooking the boardwalk. As part of the SOCIALIZING scape and a further intertwining of the site, program was inserted under the plinth providing amenities and activities such as a fitness center, restaurant, supermarket and other retail spaces. Fourth, the MOVEMENT scape being integral to the idea of the Casbah was a further development of circulation. As a counter to the rising plinth of the RECREATION scape a view corridor was cut through the site by continuing Fourth Street as a sloping plane down to the river's edge. This opened up entries to the garage and shopping center as well as led to the proposal for a new water taxi stop.